Printed worship bulletins are available at each entrance to the sanctuary. Our order of worship has five movements. We Come Together because God calls us. We Proclaim the Word, opening ourselves to God’s teachings. We Respond to the Word by presenting our many gifts before Christ’s table of grace. We Share God's Abundance to celebrate all God has done for us. We then Go Out to Serve, blessed by God’s love, to serve the world. In preaching and worship, we predominately follow a three-year lectionary format: a holistic approach to Scripture. Each Sunday, all ages hear and explore the same Scripture readings, which help foster a balanced faith life for our children, youth and adults. Communion, the center of our faith, is celebrated each Sunday and all are welcome at God’s table. Communion is most often served in the pews by deacons and the elements are passed along the pew and we serve one another. There are times when communion is served by intinction, meaning that participants are invited to come forward to break a piece of bread from the loaf and dip it in the cup. We embrace inclusive language and leadership at Central as it reflects an environment where diversity is accepted and valued. We are also an Open and Affirming Congregation, which means that we welcome all of God’s people into the full life of the church without exception. 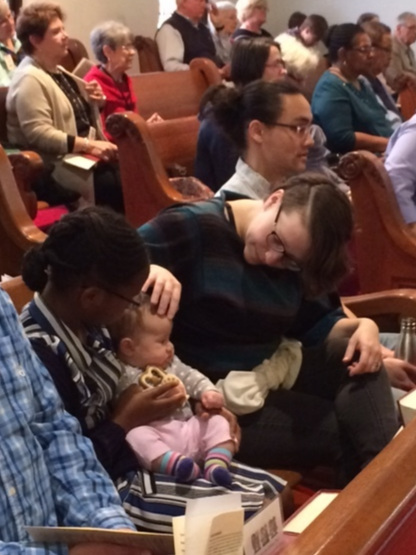 Children are very welcome in worship! We expect they will make noise, so rest assured that this isn’t a problem. If you would be more comfortable, our nursery is available for infants through age three from 10:00 AM - 12:00 PM. Our trained nursery staff will take good care of their needs and notify you if there is a problem. Our Children's Moment begins shortly after the service starts. All children are invited forward to hear each week’s lesson in an age-appropriate format. Children may then either return to their seats or participate in children's worship experiences. Adult leaders will take younger children to our Children Worship and Wonder ministry (in the Parlor) where they will safely remain until you pick them up after the service. Older children (2nd through 5th grade) are invited to attend our Young Disciples experience where the day’s scriptures are discussed. Our trained nursery staff and volunteers create a loving, Christ-centered environment for infants through the age of three. The nursery is located off Fellowship Hall, which is adjacent to the sanctuary. You will be notified if there is a problem. We use a check-in process so your child is secure. Care instructions are welcome. If you have further questions, please contact our youth and family staff at cyf@indyccc.org.